Elements Applied: Each plant’s part is dried and applied in herbal medicine. Used For: The herb is known to relieve spasms, induce expectoration, and reduce arterial pressure. 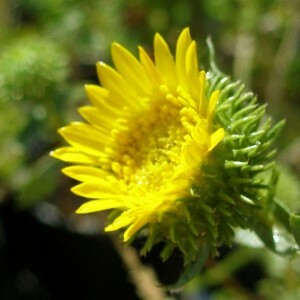 Grindelia’s effect consists in relaxing myocardium and smooth muscles. It is excellent for curing bronchial and asthmatic diseases, particularly when these conditions are linked with tachycardia and nervous tension. It can be applied for inflammations of the upper respiratory tract, coughs, bronchitis, and asthma. Due to relaxation it provides for the heart, the herb is also potent of decreasing blood pressure. As a topical remedy the plant is applied for dermatitis, induced by poison ivy. Commonly mixed with: To relieve asthma the herb is applied in conjunction with Pill-bearing Spurge and Lobelia. Additional Info: The herb is indigenous to South America and the United States. Preparation and Intake: To prepare an infusion, take a teaspoon of dry herb extract for a cup of boiling water and steep for ten to fifteen minutes. The result is consumed thrice a day. Safety: There is no data concerning the plant’s safety level. It is possible that the herb interacts with the medicine you use. Speak to your health-care provider before using the medicine.